Meet Penguin, a fun-loving water creature. You wouldn't expect one in the warm Adriatic Sea, but this is where she feels at home. And since you're on this page checking her out, we suspect you might know why. 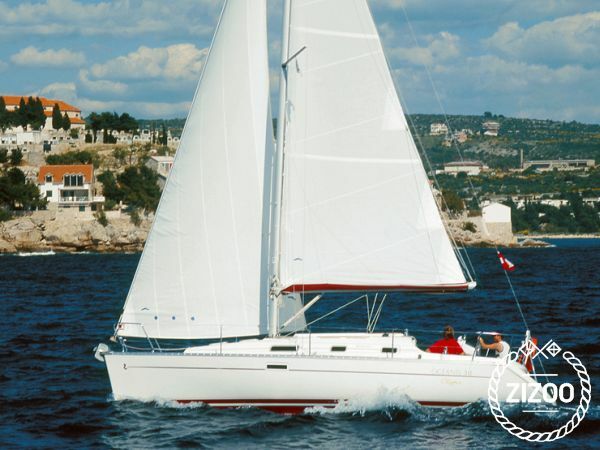 If you are quite like her, booking this playful 2003 Beneteau Oceanis Clipper 311 is just the right decision! She will welcome up to 6 of you in her comfortable double bed cabins and the saloon, so drop your stuff off, change into your swimwear and hit the deck to get tanning! Don't forget the sunscreen though, it might not feel hot in the wind while you cruise around the islands, but you will feel it at the end of the day! Find a nice cove for some sea splashing, snorkelling or even fishing, then set sail for a place where you will find restaurants serving traditional food and local wine, to make sure your perfect day is followed by an equally perfect night. Your charter team can recommend a few places, they like to know their guests are taken care of.